At happy hour, the bar in the Hotel Max is brimming with the downtown office smart set. Five o’clock out front of Miller’s Guild on Stewart Street, and traffic comes to a crawl. Office workers cling to their laptop bags while chasing the No. 36 bus, bobbing and weaving through the congested sidewalk. But inside the bar, the after-work crowd appears to have all the time in the world. Patrons are standing after two rounds of drinks, still patiently waiting for bar seats to open up. Nearby, dudes are hoisting glasses as if on a cruise bound for Bequia. Miller’s Guild may be about Game-of-Thrones-sized cuts for the expense-account set who stay at Hotel Max upstairs, but come happy hour, it’s a different animal. Suits from the U.S. District Court and office towers and folks with shopping bags throng to this bar restaurant, ordering $8 negronis and $5 beers. It’s not just the wines that are big and oaky. Gin and other spirits get aged in whiskey casks to create some robust, distinctive flavor profiles — which adds up to cocktails that cost as much as $29 (the fittingly named “Tycoon”). A daiquiri gets glammed up with rum aged in-house and banana liqueur ($13). 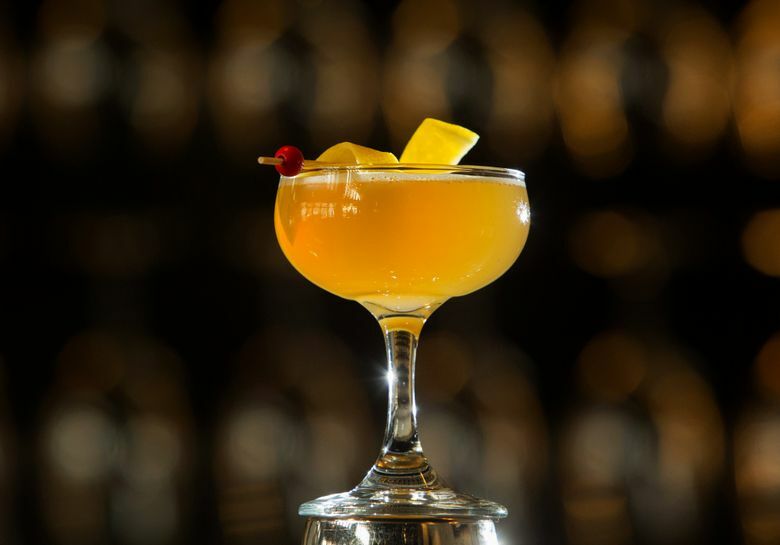 A better deal: the $8 “Between the Sheets,” a rum sidecar made famous by Harry’s Bar in Paris during the 1930s. Its burger is as decadent as you would expect: the beef is Wagyu; the bacon is thick and cured in-house. For those who splurge, there’s a $21 crab roll with generous chunks and strands of Dungeness, served with a copious amount of beef-fat fries. But good luck finding elbow room to eat at the bar after 4:30 p.m. Folks trickle in and rush to order their Viogniers and cocktails before happy hour ticks away. On a recent afternoon, a sport-coated man angled in to order a Jameson with three rocks, nearly knocking over a group of girlfriends standing in high heels. They stumbled but didn’t fall. “Must be all that core work,” someone quipped. Miller’s Guild, 612 Stewart St., offers happy hour daily 2-5 p.m. and again 10 p.m. to midnight with $8 cocktails, $7 wines and a $5 beer (206-443-3663 or millersguild.com).